At the Inter BEE show in Tokyo JVC is showing their new range of affordable 4K cameras. The most interesting is the GY-LS300 with a Super 35mm sensor. Curiously it has an active Micro 4/3 mount and is supplied body only, without a lens. Almost all lenses made for Micro 4/3 aren’t designed to cover a Super 35mm sized sensor so this choice at first seems to be a strange one. 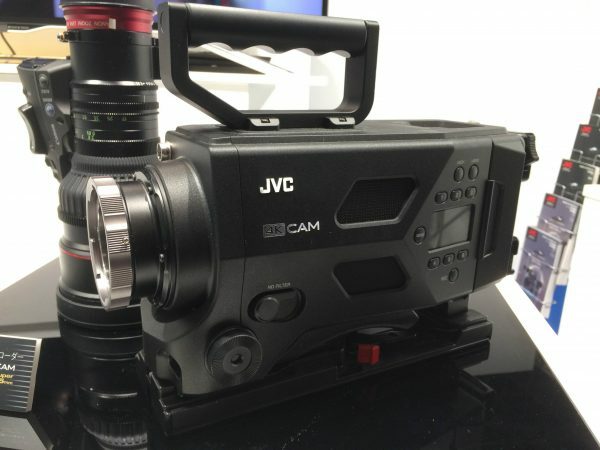 JVC reps told me that the reason for having a M 4/3 mount on a Super 35mm sensor is for versatility. 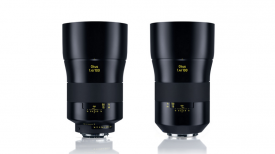 There are a large selection of lenses that can be adapted to MFT mount because the flange distance between the sensor and the mount is so short. PL mount, C mount, Nikon and Canon lenses can all be fitted with optional adapters. The JGY-LS300 JVC has a technology called Variable Scan Mapping. It involves some cropping and scaling of the sensor depending on what size image the lens is made to cover and what resolution your working in. This way it can utilise not only 4/3 MFT lenses but older Super 16mm lenses as well (although probably only in HD and not 4K). JVC couldn’t tell me exactly what sensitivity this sensor was rated at but hinted it should be around 640 ISO and on par with competitors in the same price range. With SDI and HDMI outputs and built-in ND filters it certainly ticks a lot of boxes. 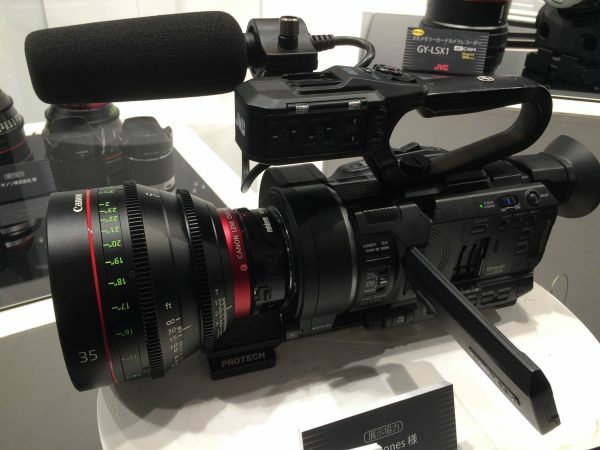 The GY-LS300 will record 4K UHD at frame rates of 24,25 and 30P in a H264 .MOV format at 150Mb/s. In HD you can record 50Mb/s in 4:2:2 at up to 60P in .MOV. AVCHD is also available in the camera. This camcorder supports dual codec recording allowing you to capture both .MOV and AVCHD simultaneously to its dual SDHC/SDXC media card slots. It incorporates 3G-SDI and HDMI outputs and supports 4K output over the HDMI out. This should make it compatible with the new Atomos Shogun. Gamma settings where harder to ascertain. The camera I saw only seemed to have two picture profiles – Standard and Cinema. Hopefully a Log type setting will be available when the camera ships. You can connect the GY-LS300 directly to a 4K Ultra HD monitor with a single HDMI cable and view the camera’s live 4K signal. You can also playback recorded files directly from the camera. In addition, the GY-LS300 down converts UHD signals to standard HD for output through the built-in SDI or HDMI connectors. One key strength of the GY-LS300 is that it supports wireless streaming to a variety of streaming services like UStream and Youtube, while simultaneously recording HD. It also supports IP network remote control, remote viewing, metadata editing, and FTP transfer of clips across a network using optional network connections and adapters. 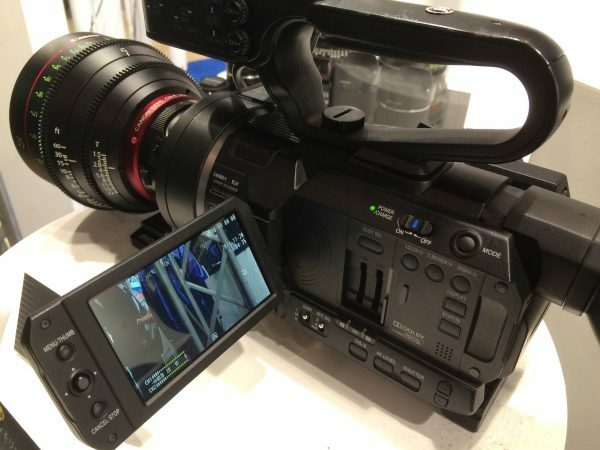 The camcorder features both a flip out 3.5 LCD viewscreen and flip up EVF at the rear. A detachable handle provides two XLR audio inputs, each with phantom power. From the quick play I had with it on the show floor I was impressed by just how light it was as well as the quality of the flip out LCD screen and the rear viewfinder. I don’t yet know how good the image quality and so can’t really judge it. The camera is due to ship in March 2015 and can be pre-ordered at B+H for $4450 US. At the price the GY-LS300 will be an interesting camera with a useful combination of features – lets wait and see what it is really capable of. JVC were also showing the GY-HM200 which has the same back end and including the same recording capabilities and functionality as the GY-LS300. 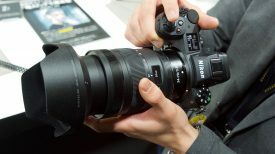 Instead of a Super 35mm sensor it features a 1/2.33” CMOS Sensor and a fixed 12x zoom lens that provides a 35mm equivalent focal range of 29.5 to 354mm (with a 24x dynamic zoom mode available when recording HD video). The other camera of note that was on display was a prototype 4K Super35mm sensor camera with a PL mount. 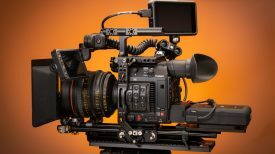 While specifications aren’t yet available JVC told me that the camera will likely record in a better codec than the GY-LS300 and have a street price under $10,000.